This 1 inch wide black leather dog harness is good for dogs that have neck problems and can't wear a collar or harness that buckles around the neck. 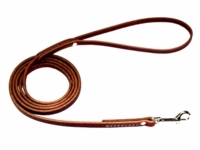 This Latigo leather dog harness has Metal buckle. 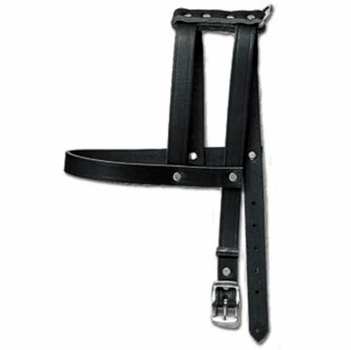 This harness has 2 inch take-up and let out and is available in sizes 26, 28, 30, 32 and 34. For example: a size 30 harness will adjust from 28 inches to 32 inches. If your dog has a 29 inch chest order the size 30. If your dog has a 30 inch chest order the size 30. If your dog has a 31 inch chest order the size 32.